December is traditionally a month when Paris focuses attention on sales of Asian art, with auctions in the rooms across the city and at the Drouot centre. A decorated three-fold screen dated to the 18th century which features a poem by the Qianlong Emperor – estimated at €60,000-80,000 at Tessier Sarrou & Associés’ sale at the Hotel Drouot. Among them is the dedicated sale being held by Tessier Sarrou & Associés on December 18 at Drouot. Highlights here include a pair of impressive late Qing dynasty elephants made of plaques of ivory on a wood core inset with semi-precious stones guided at €150,000-200,000, and this richly decorated three-fold screen dated to the 18th century which is guided at €60,000-80,000. 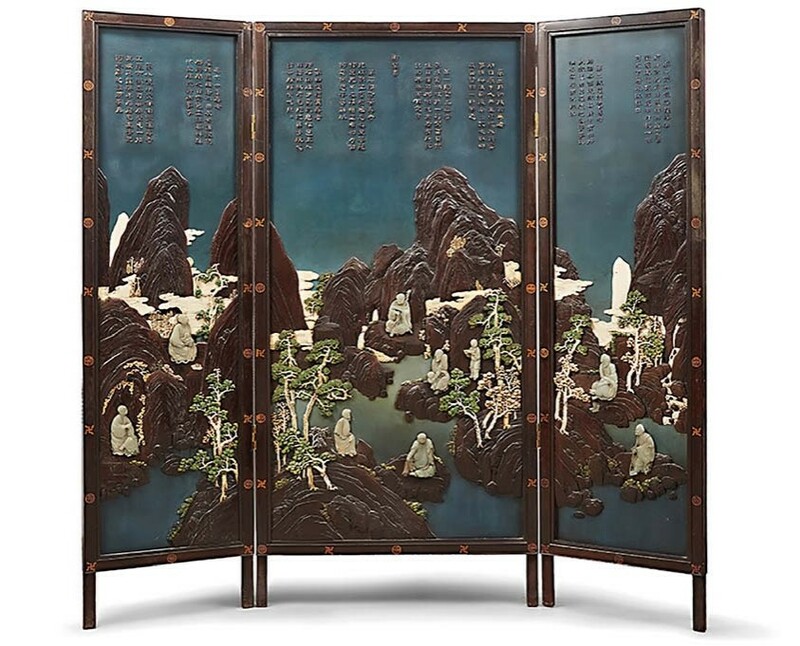 The screen, which measures 4ft 11in (1.52m) high with two 18in (46cm) wide side panels flanking a 2ft 6in (77cm) wide central panel, is composed of lacquer ground applied with hardstones, and jichimu (chicken-wing wood) plain and coloured ivory in a zitan hardwood frame. It depicts a mountainous landscape studded with pine trees and inhabited by lohans above which is a poem by the Qianlong Emperor, inscribed yu zhi zan, paying tribute to wise meditative sages. It was inspired by a voyage he made in 1757 to visit the Shengen Temple, where he saw paintings made by Guan Xui (832-912) depicting the 16 Luohan.